You may be looking for the Marine of the same name. Using Forge to manipulate objects. Forge is a gameplay mode in Halo 3, Halo: Reach, Halo 4, Halo 2: Anniversary, and Halo 5: Guardians that allows for both playing and editing multiplayer maps. Forge is a game mode originally released in Halo 3 designed to allow players to customize, save and share maps for custom games. Forge was originally created to be used by players to make relatively simple changes to maps in order to tweak their gameplay experience. Maps altered in Forge are referred to as map variants, and possible alterations include the modification of player spawn points, gametype objective points, weapon, vehicle and the addition of scenery items such as crates, fusion coils, gravity lifts, teleporters, and various other items. The amount of time and dedication spent by players in Forge mode led to the release of two Forge-specific maps, Foundry - which was released in the Heroic Map Pack - and Sandbox, which was released in the Mythic Map Pack. The scenery and layouts of these maps are almost entirely composed of movable and removable Forge objects. 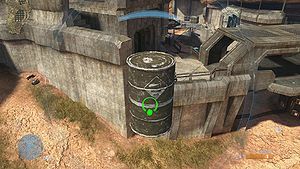 Throughout Halo 3, players were able to find a number of exploits that would allow them to place objects in the air and phased inside one another, which Bungie eventually implemented as the "Fixed" and "Phased" physics features in Reach, and have remained a staple of the mode since. Reach also brought with it an entirely dedicated Forge canvas and the currently-largest multiplayer space present in any Halo game, Forge World. With the release of Halo 4 in 2012, Forge was once again updated with a number of quality-of-life fixes including snappable magnets, highlights of selected objects and baked lighting on user-made maps, alongside four new Forge canvases - Impact, Erosion, Ravine and Forge Island. The Forge component of Halo 2: Anniversary brought with it the inclusion of large terrain components and basic scripting, allowing users to make interaction with props in the world. With Halo 5: Guardians, Forge was not included in the game's initial release, instead being delayed until the release of Cartographer's Gift. 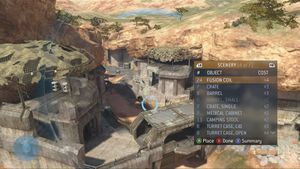 This improved variant of Forge brought about the most significant changes to the mode since those of Halo: Reach, completely overhauling Forge to resemble an development kit moreso than a simple map editor. This new version of Forge allows users to choose up to three colours for any individual object, choose textures for objects such as dust, grime and snow, place weather and visual effects on a map and even change the map's skybox entirely. The mode also allows users to place more complex lighting with the addition of dedicated point and spotlight objects similar to those found in game development kits such as those of Unreal Engine 4. In addition, Halo 5 Forge brought with it an entirely revamped control scheme and a swath of new objects to place. For the first time in the series' history, Forge in Halo 5 received multiple updates over the game's lifespan adding entirely new weapons, vehicles, REQ variants, maps and item sets. The mode also saw a number of quality of life changes to its toolset over the game's lifespan. On September 8, 2016, the Windows 10 PC store saw the release of the app Halo 5: Forge, a free download containing the full Halo 5: Guardians Forge experience for PC players. In addition to functioning as map editor, Forge is also a gameplay space. Up to eight players can be on a given map at a time, shifting back and forth between their chosen multiplayer model (Player Mode) and the Edit Mode model (a Monitor). A variety of Forge-specific settings can be altered by the party leader while in the Forge Lobby. As an example, players in Edit Mode can be granted more (or less) health and shielding as well as varying levels of Active Camouflage — editors can even be granted near or total invulnerability. There is also a setting that, if enabled, prevents all but the party leader from entering Edit Mode. Players can play actual games in Forge, experiment with Forge's features, kill each other, play diverse and varying 'honor rules' games, and do other things that aren't accepted in regular multiplayer. The Forge Menu in Halo 3. As the first game to feature the Forge mode, Halo 3 pioneered many of the features that are now staples of the mode including the pre-Halo 5: Guardians control scheme and overall layout. In this iteration of Forge, all objects were bound by engine physics; meaning objects would fall when dropped. This is due to Forge's intention as a map editing as opposed to a map creation tool, with the intention being to replace weapons, vehicles, spawn points etc. Most maps featured only basic object palletes consisting of a selection of weapons and vehicles (though oftentimes not all - for example, the M7057 flamethrower was only available on a handful of maps even in Forge) and a small selection of scenery objects such as crates and barricades. The release of the maps Foundry and Sandbox greatly expanded upon the toolset available to Forgers via more dedicated scenery and structure objects, leading to "Forge art", the creation of new modes such as Grifball and the discovery of a number of exploits that allowed players to phase objects inside one another or float in the air. The Forge Main menu from Halo: Reach. 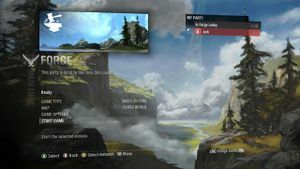 Forge mode returned in Halo: Reach as Forge 2.0, with a variety of updated tools to allow players to more easily edit and create maps, and a larger Forge palette that was updated to include items from the Halo: Reach sandbox. A map designed for players to create their own Forge map variants named Forge World was shipped with the game. The mode was first shown off in the ViDoc "Forge World", showcasing a vast array of new tools and features, many inspired by community feedback and creations made in Halo 3. Among the most notable were the introduction of object physics, allowing objects to be "Normal", "Fixed" and "Phased". When in normal physics, objects interact with the world as they did in Halo 3. Fixed mode was similar, though objects would not fall when dropped; phased was the largest addition, allowing Forgers to disregard object collision entirely and place geometry inside other geometry. To suit the ability to create impractical structures, Forge World was set on a Halo ring and the item pallette was largely given a Forerunner-themed aesthetic. While Forge World was the then-largest map in Halo history, it was the only map on launch to be designed for Forging as a canvas, with most maps not supporting the vast majority of placeable items. Notable exceptions would include the map Tempest of the Noble Map Pack and the maps featured in the Anniversary Map Pack, all of which supported a large complement of the objects placeable on Forge World. Halo 4's Forge, as displayed at RTX 2012. Forge returned in Halo 4 with several improvements from its previous iteration in Halo: Reach, though not to the same extent as the changes experienced going into Reach. The duplication tool has returned from Halo 3, and selected objects now glow green depending on what type of object is selected for better precision, preventing players from accidentally deleting objects they did not intend. The feature now supports dynamic lighting on Forge objects, enabling each individual pieces to cast shadows. It features additional tools for user for map-making such as the ability to link Forge objects seamlessly through the use of the magnet utility and adding trait zones (such as enhanced movement and gravity). Objects can be locked, preventing being grabbed/moved. More Forge objects have been added to the sandbox to provide variety to the map-making experience. Infinity ordnance will be a customizable feature. Halo 4 features four different Forge maps: Erosion, Impact, Ravine and Forge Island. Each map features a different environment and unique palette elements. An overview of the features in Halo 2: Anniversary's Forge mode. Halo 2: Anniversary features a Forge mode, the first available on the Xbox One, though only in the reimagined multiplayer component based on the Halo 4 engine. The new Forge features several bug fixes from Halo 4, including menu polishing and adding magnet location consistency. Precision control and zoom have also been added. New features include "Snap to Ground", "Align to Ground", and "Movement Snap". Tool settings are now stored between Forge sessions. The Forge "Structure" palette is now cleaner and smoother, along with new mirrored versions of objects. Additional natural and terrain structure pieces—including cliffs and large pieces of land—have also been added to the Structure palette. Three Skybox-only maps—Awash, Nebula, and Skyward—have been added, allowing players to create maps and structures without interference from previous existing structures. The new Forge budget is now based on the amount of objects in a map. The budget can essentially be replaced by a "Performance Meter", presumably determining how well the map will run given the amount of objects placed. In an official demonstration, the developers showcased a map containing a remake of Beaver Creek within a much larger Forged landscape, built completely on a flat canvas using the new terrain pieces. "Simple scripting objects" have been added as Forge objects; these allow players to create interactive systems including switches that can be used to perform various tasks, including opening doors, spawning vehicles or terrain objects, or triggering explosions. There have also been Gadget improvements and new Gadgets. All seven of the Halo 2: Anniversary remastered maps feature dynamic features that alter gameplay, such as falling stalactites and breakable glass roofs on Lockdown. These features can be disabled to Forge if the players wish to have a gameplay experience that is closer to the original Halo 2. Forge in Halo 5: Guardians. Halo 5: Guardians features Forge 5.0, an even more advanced form of Forge than Halo 2: Anniversary. It was released as a free feature on December 16 2015 and it will also be given new features and content on a regular basis. Forging is available for any Arena, Breakout and Big Team Battle maps, as well as the seven blank canvas maps Alpine, Barrens, Depths, Glacier, Parallax, Tidal and Breakout Arena. Among the improved features are the control scheme, selecting and manipulating up to 64 objects at once, a free camera, and smart magnets. Objects are no longer constrained to certain maps, as was the case in previous games. Up to 1700+ objects can be spawned into the map and new types have been added. Terrain objects are designed to seamlessly blend into the prebuilt terrain. Objects can be grouped with a single button press and "welded" to a parent object, allowing the objects to physically move around together. Almost any object can be scripted to move, change colors, spawn, and etc. The budget system has been improved, including a multi-budget system, where a terrain piece will only eat into the memory budget once. Additional pieces only use up the object count because the shared texture is already loaded. Other budgets are considered "soft" and can be exceeded, but doing so causes glitches. New light objects have been added with tons of different properties. Light fixtures such as light posts, beacon lights and etc. have been introduced. Lighting is no longer generated automatically when switching to player mode. A button tap will drop the Spartan, while holding it down will render the lighting before dropping. Props like the D79-TC Pelican were added in Hammer Storm and can be customized with colors. Weather effects including rain, snow, embers, floating papers, dust, and motes were added with Ghosts of Meridian. Sound options ranging from chanting Covenant crowds to waterfalls are also available for sur. Halo 5: Forge is a port of the Forge mode to Windows 10. It is available for free and enables players to forge, test, and share their own maps on PC, with compatibility with Halo 5: Guardians on Xbox One. If the player catches on fire (from a Firebomb Grenade or the Flamethrower) and then enters Edit Mode, they will take no damage. Upon returning to Player Mode, however, they will find that the fire was "preserved", they will once again take damage. It also applies to any momentum that the player gathered while in Player Mode, if they jump into a Grav Lift or man cannon, enter Edit Mode, move away, and then return to Player Mode, they will fly through the air. This was changed in Halo: Reach as changing to edit mode arrests the players motion; despite this, motion is sometimes preserved anyways. However, if someone in Edit mode is moving when they return to Player mode, their velocity is carried over, and can result in dying if the change happens when flying fast, as Halo: Reach physics causes damage to players if they hit any object while moving too fast. In Halo 4's forge, momentum is not preserved upon exiting edit mode. The Elephant cannot be spawned by editors due to its size, potential for lag, and specific purpose on Sandtrap, however more can be modded into the map. Created map variants can be saved and shared with the community. Also, if the players creation is extremely liked by Bungie, they may even add it to matchmaking. The idea of Forge was taken from Marathon: Infinity, which also has a map editor named Forge. However, there are multiple differences: Marathon's Forge was a separate application, acting as a 'pure' map editor in conjunction with another application, Anvil, which edited physics, sounds and shapes files. On the other hand, Halo 3's Forge is merely a separate game mode that allows for the spawning and repositioning of objects. If the player stacks both Elephants on top of each other and then put as many large objects (tanks) as they can on top the bottom, the Elephants will have reverse gravity. Through a glitch, it is possible to wield weapons while in Edit Mode. During lag or a glitch, it is possible to see the small blueish-white tear drop shaped orbs (item spawn points) that denote where an object has been placed while in Player Mode. When this happens, the spawn points can be interacted with while in Player Mode. If the player shoots or melees them, they will hear the same sound that plays when shooting or beating a shield door. When the player is in Edit Mode, the reticule in the center of the screen appears to be the Marathon symbol. This is probably due to the fact that the eye of the Monitors resemble the same symbol. There is a mistake when editing options in forge, it says: View current options. Only the party leader may change options, regardless of whether or not that person is the party leader. It is unknown why the player cannot place certain weapons on certain maps, but it is probably due to balancing. Vehicles would be unable to evade Missile Pods in indoor maps, and large vehicles like Wraiths and Scorpions might not even fit inside of indoor maps with small doors or rooms. However, weapons such as Fuel Rod Guns and Flamethrowers have limited use due network and performance issues. The Forge 2.0 monitor makes a small noise when boosting. In Halo: Reach, after a player goes in to Monitor mode, the Monitor will have a shield/health HUD similar to that of the species which it was transformed from. However, if a player dies while in Monitor mode, when he/she respawns(as a monitor), it will have a Monitor HUD from Halo 3, showing only the shield bar. Exiting then reentering monitor mode after this will give a normal Spartan/Elite HUD. In Forge 2.0, if there is lag during a forge session and a player goes into Edit Mode, a Focus Rifle icon will appear for a second and disappear and the reticule will go from Focus Rifle reticule to edit reticule and if your pressing the fire button, the player will emit a short Focus Rifle blast with sound effect for as long as the Focus Rifle reticule is visible. Only that player will see and hear the Focus Rifle blast. The Halo: Reach player spawn point object features a holographic Spartan crouching with an M6G pistol aimed forward. The Spartan has a specific armor permutation that includes a variation of the Mark V[B] helmet with UA that was exclusive to Halo: Reach Beta, Mark V right shoulder, CQC left shoulder, Tactical/Tacpad wrist attachment, Tactical/Trauma Kit utility on the right thigh, and FJ/PARA knee guards. The initial spawn points in Halo 4 use the same Spartan hologram model as the initial spawn holograms previously used in Halo: Reach. Crates and an M12 Warthog LRV on Forge. Spawning an M808C Scorpion on High Ground. Concept art of a Forge game in Halo: Reach. A Forge creation in Halo 4. A Forge Monitor in Halo 4. Forge in Halo 2: Anniversary. Beaver Creek recreated in Halo 2: Anniversary's Forge. Some of the weather effects in Halo 5: Guardians' Forge. Some of the material bases in Halo 5: Guardians' Forge. Features introduced into Forge with Warzone Firefight. A remake of the Firebase from Halo Wars in Halo 5: Guardians Forge. ↑ Halo Waypoint: The Halo Bulletin: 7.6.12.